The time passes by so quickly, with each day bringing some sort of adventure. It could be simple, like the juice bar at Cafeteria Sana’a not having the ginger juice tasted on the initial visit and trying first mango, then cantaloupe, and also lemon-mint on each subsequent stop. Some adventures are frustrating, like when several atm machines refuse to give you money and the tourism agency and official money brokers have different ranges of American dollar bills they will accept. Remember when the United States added all those colors to our boring green money? Well, Djiboutians don’t like old money. Some adventures are hysterical, somehow causing the hotel room chair to fail when sitting. The environment remains fascinating. People are surprised to see American tourists here. Not surprised to see Americans as we have quite the military presence. French workers and military are here, in addition to a Japanese base, though I have seen only a few French families (late in the evening in the classy restaurants) and no Americans nor Japanese. The heat (90 degrees F) and humidity (85%) have not bothered me, and I feared it would be unbearable. I have consumed 2-3 liters of water a day. The town shuts down from 1-4 every day to keep everyone from melting. So this is our quiet time where we have snacks from the grocery store, drink more water, sit on the patio (fans blazing), M smokes, and then we return to our hotel room to cool. Breakfast is croissant or other bread with coffee. Mid-morning we typically stop for juice. 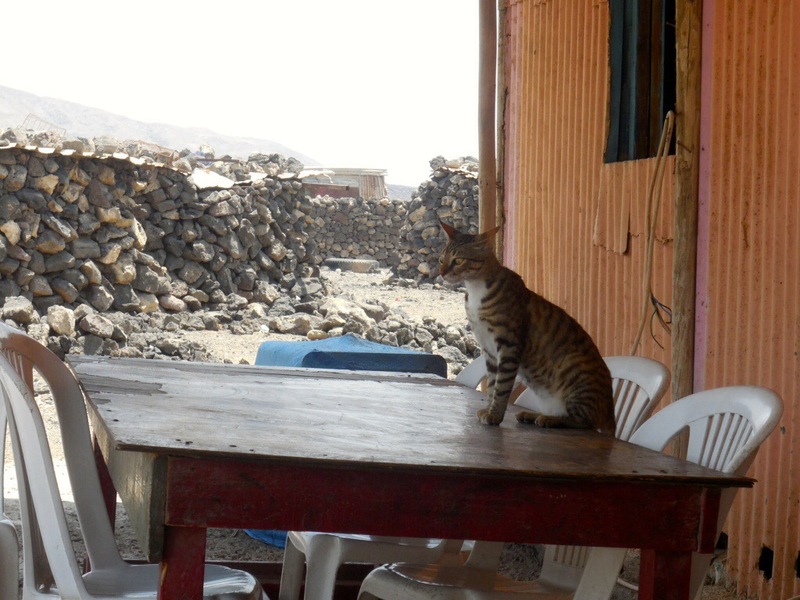 Yesterday we had lunch, primarily because we did a tour excursion to Lac Assal and the guide handed it to us. For dinner, we tried the pizzeria in the hotel (where the staff works very artfully on the product though they should have cooked it longer). Then we visited an Indian restaurant recommended by another hotel guest. That place had a delightful ambiance from the moment we entered. Le Santal features Indian and Chinese cuisine and pizza, the international food. (We returned there a second time, prompting the owner to chat with us and give us baklava.) Next, we had Ethiopian, another wonderfully decorated place, but neither M nor I really favor Ethiopian cuisine. With the broken right hand, it presents a bit of a hand-eating challenge. That said, tonight we shall delve into Djiboutian. 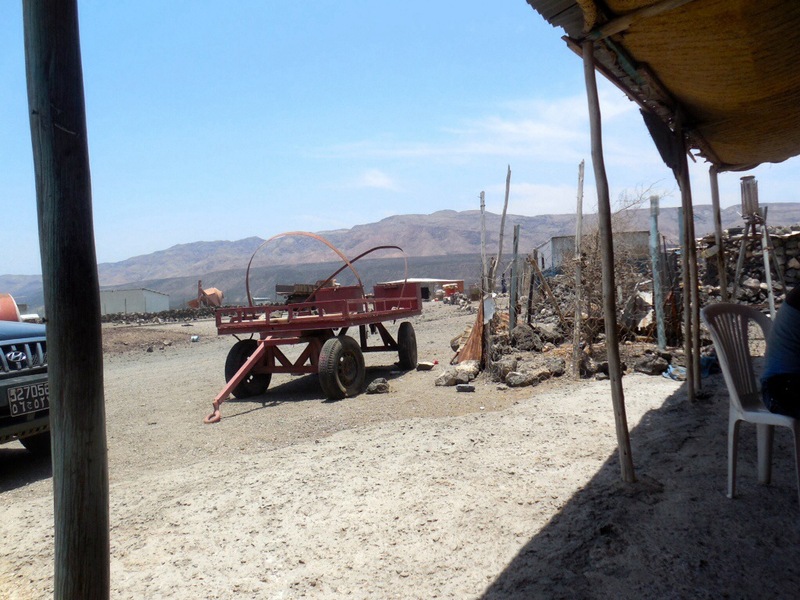 I am positively stunned by the geography, especially after our trip to Lac Assal. We would both like to go to Lac Abbé but are reluctant due to the ten hour drive. Tomorrow we will trek to Ile Moucha. Yesterday we visited a variety of places along the way to Assal. I will hopefully break those down later. I would like to save that for the photos and after I pick up a Djibouti book I saw in the store. Except I needed about 6,000 Djiboutian Francs and I only have 4,000 and the ATM refuses to give me money. By the time we figured that out, the shops had closed for 1 p.m. break. The book will at least provide correct spellings. The tour guide, driver and company did a fantastic job with our excursion. If you are every in Djibouti, call Daniel Jean at Bambu Service Touristik. What I enjoyed, in addition to breathtaking scenery and warm water pools and the salt lake, was seeing the breakdown of how people live. You can see areas of Djibouti-ville that seem like your average developing (“third world”) city, and then there are areas for industry (I passed the big Coca Cola plant, one of the main employers here) and I’d like to believe we drove by some lovely French villas walled off from the rest of the city. In that respect, colonial ideals may still be in full bloom. The roads are primarily straight. Road signs point to major cities or even the next country. Nomad villages are everywhere, as people move to find water. 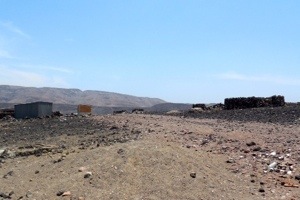 In some places, the huts are made of wood and metal, others sticks and tarps, and yet in what I assume are the more stable villages, the nomads take the volcanic rock and build their shelters. 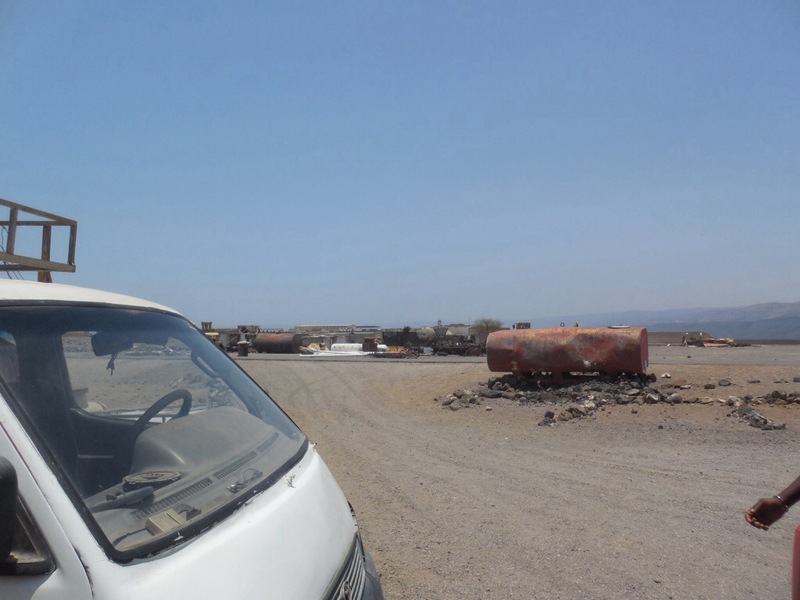 Because of the severity of drought here (and even our hotel often has water shortages when you turn on the faucet and nothing comes out), some international aid agencies (I believe Japanese UNICEF is one) have started delivering 50 gallon drums of water to these villages. 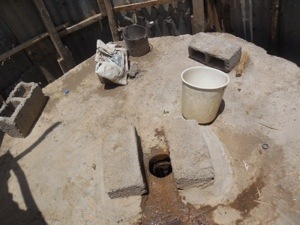 I had the opportunity to use the nomad toilet facility, which while primitive by Western standards, was quite nice and included a bucket of water and water bottle scoop for cleansing. I mention this because I think it’s very important to understand that nomadic people don’t have a lesser existence than we do. Sometimes I fear that Western ideas of international development focus too much on issues like infrastructure and unemployment and not enough on basics like clean water and education. 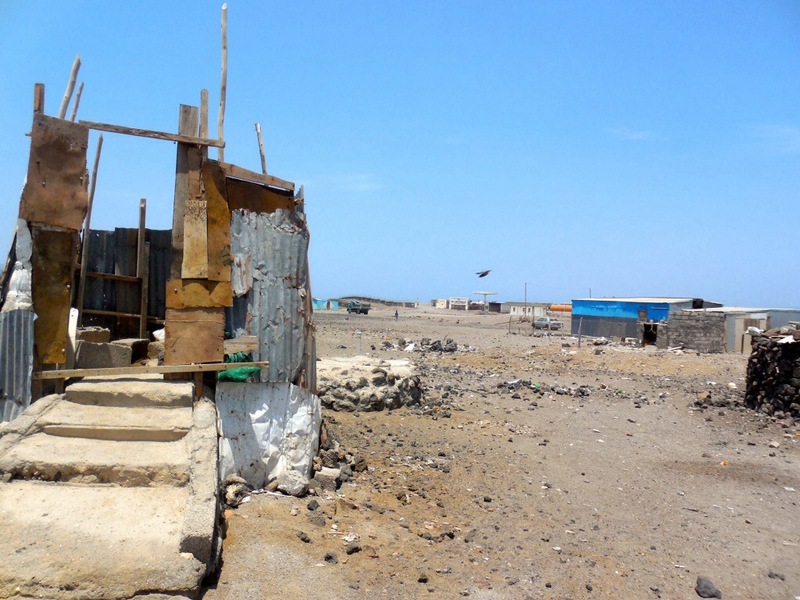 The Afar nomads may not have jobs, electricity or running water, but why do they need it? They follow the rain and the water to feed and care for their cattle. Disease and malnutrition are of course serious for any society, especially among people with so little modern resources. But I envy one element of their simple existence: they have survival skills that I can’t fathom. If suddenly my bank cards, car, refrigerator and two-story house disappeared, I would have no clue how to build my own shelter out of sticks and stones. I could probably care for a goat, but slaughter it? No clue. Who, in the end, will endure? The cat photo is from the restaurant, but the black stone structures in the background are homes.